The previous technique has excellent best-case behavior, generating a random roll using a single fair die roll and coin flip. On expectation, its worst-case behavior is much worse, though, potentially requiring a linear number of die rolls and coin flips. The reason for this is that, unlike the previous techniques, the algorithm may “miss” and have to repeatedly iterate until it decides on a decision. Graphically, this is because it works by throwing darts at a target that may contain a large amount of empty space not assigned to any outcome. If there were a way to eliminate all of that empty space such that every piece of the target was covered by a rectangle corresponding to some side of the loaded die, then we could just throw a single dart at it and read off the result. What we have below has several excellent properties. First, the total areas of the rectangles representing each side of the loaded die are unchanged from the original; all we’ve done is cut those rectangles into pieces and move them around. This means that as long as the areas of original rectangles are proportionally distributed according to the original probability distribution, the total area dedicated to each side of the die is the same. Second, notice that this new rectangle has no free space in it, meaning that any time we toss a dart at it, we are guaranteed to hit something that will give us an ultimate answer, not empty space that requires another dart toss. This means that a single dart toss suffices to generate our random value. Finally, and most importantly, note that each column has at most two different rectangles in it. This means that we can retain our intuition from before – we roll a die to determine which biased coin to toss, then toss the coin. The difference this time is what the coin toss means. A toss of heads means that we pick one side of the die, and a toss of tails now means that we should pick some other side of the die (rather than rolling again). At a high level, the alias method works as follows. First, we create rectangles representing each of the different probabilities of the dice sides. Next, we cut those rectangles into pieces and rearrange them so that we completely fill in a rectangular target such that each column has a fixed width and contains rectangles from at most two different sides of the loaded die. Finally, we simulate rolls of the die by tossing darts randomly at the target, which we can do by a combination of a fair die and biased coins. some rectangle corresponding to side ii is placed in column ii. And voilà! We’ve filled in the table. Find some rectangle that has height at most 1 and place it into its own column, setting the ProbProb table to the height of that rectangle. Find some rectangle that has height at least 1 and use it to top off the column, setting the AliasAlias table to correspond to the side of the die represented by the rectangle. Can we prove that this general construction is always possible? That is, we don’t end up getting “stuck” when distributing probabilities this way? Fortunately, the answer is yes. The intuition behind this is that we’ve scaled all of the probabilities such that the average of the new probabilities is now 1 (because originally it was 1n1n, and we multiplied everything by nn). We know that the minimum of all the scaled probabilities must be no greater than the average and that the maximum of all the scaled probabilities must be no less than the average, so when we first start off there always must be at least one element at most 1 (namely, the smallest of the scaled probabilities) and one element at least one (namely, the largest of the scaled probabilities). We can thus pair these elements together. But what about once we’ve removed these two? Well, when we do this, we end up removing one probability from the total and decreasing the total sum of the scaled probabilities by one. This means that the new average hasn’t changed, since the average scaled probability is one. We can then repeat this procedure over and over again until eventually we’ve paired up all the elements. Theorem: Given kk width-one rectangles of heights h0,h1,...,hk−1h0,h1,…,hk−1 such that ∑k−1i=0hi=k∑i=0k−1hi=k, there is a way of cutting the rectangles and distributing them into kkcolumns, each of which has height 1, such that each column contains at most two different rectangles and the iith column contains at least one piece of the iith rectangle. Proof: By induction. As a base case, if k=1k=1, then we have just one rectangle and its height must be 1. We can therefore assign it to the 00th column. Thus each column has height 1, contains at most two rectangles, and the 00th column contains at least one piece of the 00th rectangle. For the inductive step, assume that for some natural number kk the theorem holds and consider any k+1k+1 rectangles of width 11 and heights h0,h1,...,hkh0,h1,…,hk such that∑ki=0hi=k+1∑i=0khi=k+1. We first claim that there is some height hlhl such that hl≤1hl≤1 and some different height hghg (such that l≠gl≠g) such that hg≥1hg≥1. To see this, assume for the sake of contradiction that there is no hlhl with hl≤1hl≤1; this would mean that hi>1hi>1 for all natural numbers ii in the range 0≤i≤k0≤i≤k. But then we have that k+1=∑ki=0hi>∑ki=01=k+1k+1=∑i=0khi>∑i=0k1=k+1, which is clearly impossible. Thus there is some index ll such that hl≤1hl≤1. Now, suppose for the sake of contradiction that there is no other height hghg (with l≠gl≠g) such that hg≥1hg≥1. Then we must have that each other hg<1hg<1, which would (by similar logic) mean that ∑ki=0hi<k+1∑i=0khi<k+1, a contradiction. Consequently, we have that hl≤1hl≤1 and hg≥1hg≥1. Now, consider the following construction. Place hlhl into column ll, and fill the remaining 1−hl1−hl space in the llth column with a piece of the rectangle hghg (such space must exist, since 0≤1−hl≤10≤1−hl≤1 and hg≥1hg≥1). This completely fills the column. 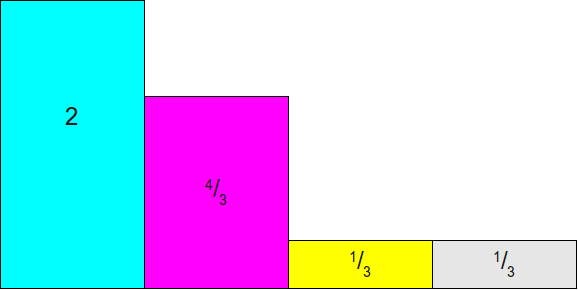 We are now left with a collection of kk different pieces of rectangles whose total sum is kk, since we removed 11 total area from the rectangles, whose initial total sum was k+1k+1. 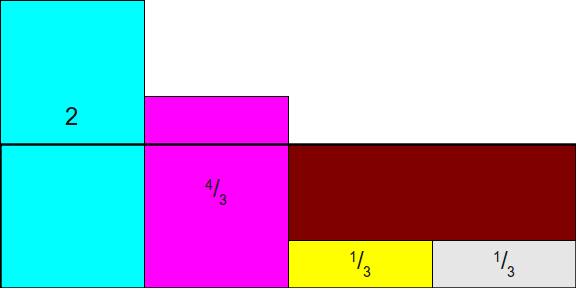 Moreover, we have completely filled column ll, so we will never try placing any more pieces of the rectangle there. Thus, by the inductive hypothesis, we can assign the remaining kk rectangles into kk columns while satisfying the above conditions. Combined with the fact that we have now filled column ll, this means that we have a way of filling all the columns while satisfying the constraints. This completes the induction. This is a constructive proof that says that not only can we always build the alias table, but that the above algorithm of finding a rectangle of height at most one and pairing it with a rectangle of height at least one will always succeed. From here, we can start devising faster and faster algorithms for computing alias tables. Multiply each probability pipi by nn. Create arrays AliasAlias and ProbProb, each of size nn. Find a probability plpl satisfying pl≤1pl≤1. Remove plpl from the list of initial probabilities. Let ii be the last probability remaining, which must have weight 1. Generate a fair die roll from an nn-sided die; call the side ii. Flip a biased coin that comes up heads with probability Prob[i]Prob[i]. If the coin comes up “heads,” return ii. Compared to the other efficient simulation techniques, this naive alias method has a large initialization cost, but can then simulate die rolls extremely efficiently. If we could somehow reduce the initialization cost to something lower (say, O(n)O(n)), then this technique would be strictly better than all of the other techniques employed here. Create a balanced binary search tree TT. Insert n⋅pin⋅pi into TT for each probability ii. Find and remove the smallest value in TT; call it plpl. Find and remove the largest value in TT; call it pgpg. However, there is an algorithm that runs even faster than this approach. It’s remarkably simple, and is perhaps the cleanest of all of the algorithms for implementing the alias method. This algorithm was originally described in the paper “A Linear Algorithm For Generating Random Numbers With a Given Distribution” by Michael Vose, and has become the standard algorithm for implementing the alias method. The elements of the “small” worklist are all less than 1. The elements of the “large” worklist are all at least 1. The sum of the elements in the worklists is always equal to the total number of elements. Caution: This algorithm suffers from numerical inaccuracies. A more numerically sound algorithm is given later. Create two worklists, SmallSmall and LargeLarge. Multiply each probability by nn. If pi<1pi<1, add ii to SmallSmall. Otherwise (pi≥1pi≥1), add ii to LargeLarge. Remove the first element from SmallSmall; call it ll. Remove the first element from LargeLarge; call it gg. If pg<1pg<1, add gg to SmallSmall. Otherwise (pg≥1pg≥1), add gg to LargeLarge. Given the three above invariants, the first part of this algorithm (everything except the last loop) should be reasonably self-explanatory: we continuously pair some small element from SmallSmall with a large element from LargeLarge as normal, then add the remainder of the large element to the appropriate worklist. The last loop in the algorithm requires some explanation. Once we have exhausted all of the elements from the SmallSmall list, there will be at least one element left over in the LargeLarge list (since if every element was in SmallSmall, the sum of the elements would have to be less than the number of remaining elements, violating the last invariant). Since every element of LargeLargeis at least 1, and since the sum of the kk elements in LargeLarge must be equal to kk, this means that every element in LargeLarge must be exactly equal to 1, since otherwise the total would be too large. This final loop thus sets every large element’s probability to be 1 so that the columns containing the large element are all equal to 1. In this algorithm, the type of worklist does not matter. Vose’s original paper uses stacks for the worklist because they can be efficiently implemented using arrays, but we could use a queue instead if we’d like. For simplicity, though, we’ll use a stack. And finally, since the SmallSmall stack is empty, we put the yellow block into its own column and are done. We now have a well-formed alias table for these probabilities. The computation to determine whether or not a probability belongs in the SmallSmall or LargeLarge worklist may be inaccurate. Specifically, it may be possible that scaling up the probabilities by a factor of nn has caused probabilities equal to 1n1n to end up being slightly less than 11 (thus ending up in the SmallSmall list rather than the LargeLarge list). The computation that subtracts the appropriate probability mass from a larger probability is not numerically stable and may introduce significant rounding errors. This may end up putting a probability that should be in the LargeLarge list into the SmallSmall list instead. The combination of these two factors means that we may end up with the algorithm accidentally putting all of the probabilities into the SmallSmall worklist instead of the LargeLargeworklist. As a result, the algorithm may end up failing because it expects the LargeLarge worklist to be nonempty when the SmallSmall worklist is nonempty. While SmallSmall is not empty: This is only possible due to numerical instability. Phew! We’ve covered a lot of ground here! We’ve explored several different methods for simulating loaded dice, beginning with a very simple set of techniques and concluding with extremely fast and efficient algorithms. Each method shows off a different set of techniques, and I find the final version (Vose’s alias method) to be one of the most interesting and elegant algorithms I have ever come across. If you are interested in seeing code for Vose’s alias method, including a quick summary of what complications arise in practice due to numerical inaccuracy, I have a Java implementation of the alias method available at the Archive of Interesting Code. If you have any questions, comments, or corrections, please feel free to contact me at [email protected].